Ensemble also provides specialized business service classes that use SOAP, and one of those might be suitable for your needs. If so, no programming would be needed. See Connectivity Options in Introducing Ensemble. Because it is a web service, it has a WSDL document (generated automatically) that describes the web methods available in it. The service can receive any SOAP message that conforms to the WSDL and sends SOAP responses in return. Because it is an Ensemble business service, it is an integral part of the Ensemble production to which you add it. Monitoring, error logging, runtime parameters, and all the rest of the Ensemble machinery are available as usual. An Ensemble web service is not available unless the production is running (and the business service is enabled). Communication with the outside world is done via SOAP request and response messages. Ensemble request and response messages are used within the production. To create a web service in an Ensemble production, you create a new business service class as described here. Later, add it to your production and configure it. SERVICENAME Name of the web service. This name must start with a letter and must contain only alphanumeric characters. The default service name is "MyEnsembleRequestWebService"
NAMESPACE URI that defines the target XML namespace for your web service, so that your service, and its contents, do not conflict with another service. This is initially set to http://tempuri.org which is a temporary URI used by SOAP developers during development. TYPENAMESPACE XML namespace for the schema in the types defined by the web service. If you do not specify this parameter, the schema is in the namespace given by NAMESPACE instead. RESPONSENAMESPACE URI that defines the XML namespace for the response messages. By default, this is equal to the namespace given by the NAMESPACE parameter. The class should define web methods, as described in the Defining Web Methods section. // Create the SOAP response, set its properties, and return it. This section describes the basic requirements for an Ensemble web method. Mark the method with the WebMethod keyword. If the method uses an object as an argument or a return value, you must ensure that the object is XML-enabled. That is, the class definitions for the types must extend %XML.Adaptor. The default settings for this class are normally suitable; if not, see Projecting Objects to XML. If the method uses a data set as an argument or return value, you must ensure the data set is of type %XML.DataSet, which is an XML-enabled subclass of the standard %ResultSet. To use a collection (%ListOfObjects or %ArrayOfObjects) as an argument or a return value, you must ensure that the ELEMENTTYPE parameter of the collection is set and refers to an XML-enabled class. In most cases, web methods should be instance methods. Within a web method, it is often necessary to set properties of and invoke methods of the web service instance to fine-tune the behavior of the method. Because a class method cannot do these tasks, a class method is usually not suitable as a web method. For additional notes, see Basic Requirements in the chapter Creating Web Services in Creating Web Services and Web Clients in Caché. Create an Ensemble request message and set its properties with information from the inbound SOAP message. Check the status returned from the previous step and react appropriately. In the case of success, look at the Ensemble response message that is returned by reference and use it to create the return value of the web method. As noted previously, the return value must be XML-enabled so that it can be packaged as a SOAP response. In the case of failure, call the ReturnMethodStatusFault() or ReturnStatusFault() method of the web service so that a SOAP fault can be returned and an Ens.Alert can be generated; see the next section for details. pStatus is the status to use in the returned SOAP fault. This is used to create the details of the SOAP fault. Also notice that these methods set the <faultactor> element of the SOAP fault. Ensemble automatically creates and publishes a WSDL document that describes your Ensemble web service. Whenever you modify and recompile the web service, Ensemble automatically updates the WSDL correspondingly. The following simple example shows an Ensemble web service that can be used to look up customer information, given a customer ID. The example web method (GetCustomerInfo) uses SendRequestSync() to communicate with a business operation elsewhere in the production. The method receives an Ensemble response message and uses it to create a SOAP response message. The SOAP response class has the same properties as the corresponding Ensemble response class. 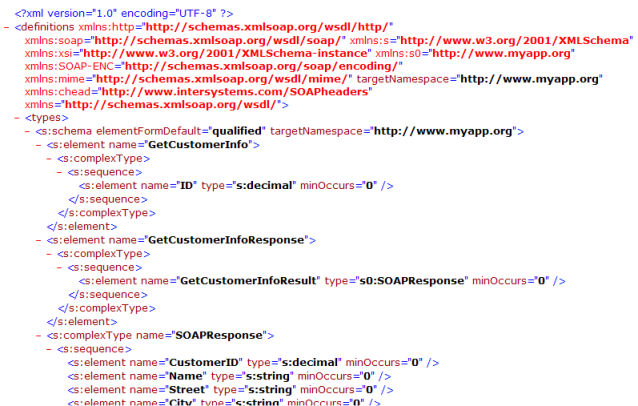 Unlike the Ensemble response, however, the SOAP response class is XML-enabled and non-persistent. Support for SOAP sessions is controlled by the SOAPSESSION class parameter. The default is 0, which means that the web service does not use sessions. To enable SOAP sessions, create a subclass of EnsLib.SOAP.Service and set SOAPSESSION to 1 in the subclass. Base your Ensemble web service on this subclass. For more information on SOAP sessions, see Creating Web Services and Web Clients in Caché in the Caché documentation. For these options and others, see Creating Web Services and Web Clients in Caché in the Caché documentation set. Set the Pool Size setting to 0. For other settings, see Configuring Ensemble Productions.